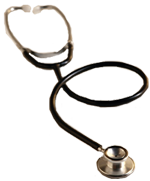 The Stethoscope transmits the sound from the Chest piece through air filled hollow tubes to the ears. The Chest piece has two sides. A diaphragm side and a Bell. The diaphragm is a plastic disc while the Bell is a hollow metal cup. When the diaphragm is placed close to the chest, the body vibration produces acoustic pressure waves which pass through the hollow tubes to the listener’s ears. The Diaphragm passes higher frequency sounds. On the other hand, if the bell is placed on the chest, the vibrations of the skin directly produce acoustic waves which pass into the ear of the listener. The bell transmits low frequency sounds. Stethoscope components are made of plastic and rubber, so that it can be damages easily if handled carelessly.